Manufacturer of a wide range of products which include steel cord conveyor belt. Current mining techniques demand that Conveyor Belts handle ever greater volumes with increased centre distances and high lifts, all of which necessitate stronger belts. The high strength of Steel Cord tension carrier is not the only reason why Steel Cord belts are increasingly being used as an economic alternative to other bulk material handling methods. When operating tensions in excess of 2500 kN/m are required, belts reinforced with Steel Cord are the only alternative and today Steel Cord belts are being designed for ratings up to ST10000. Yet, due to its numerous advantages, Steel Cord belts are increasingly used even in ratings as low as ST 500/630. Conveyor Belts with Steel Cord reinforcement members are virtually maintenance-free and can be supplied with increasingly thicker rubber covers for the same rating. The carcass, having a minimal risk of failure, yields very long life without affecting the overall design, sometimes even lasting for the entire duration. Steel Cord Belts have very low elongation and consequently, systems with large center distances can be planned, without having to account for limitations of take-ups and transfer points. The 'building block' for the reinforcing Steel Cords are round steel wires. These Zinc/Brass coated high-carbon wires are laid helically with a uniform twist around a central core to form the 'Strand'. Strands so formed are, in turn, helically laid around a central strand to form the reinforcement 'Cord' of the Steel Cord belt. Forech sources Steel Cords only from globally established manufacturers and conducts periodic checks on the cords supplied to evaluate the Component Dimensions, Tensile Strength, Elongation (Static & Dynamic), Openness, Effectiveness of coating, Cord Pullout strength etc. Cord types 7x7 and 7x19 are most popular and can cover a large range of Steel Cord Belt ratings. The function of the bonder rubber is to maintain a bond between the metallic cords and the rubber polymer in the Steel Cord Belt. The bonder rubber not only has to create the metal-rubber bond but – for optimal product performance – is also required to be viscous enough to flow into the air gaps/voids between individual filaments in each cord to offer additional protection against environmental threats as well as to protect adjacent filaments from chafing against each other. Forech manufactures its entire range of Steel Cord Belts (in widths up to 2000mm and in ratings up to ST 10000) in General Purpose or Fire Resistant Grades(refer to the chart below). For extreme applications, Heat Resistant and Oil Resistant Belts can be supplied. All General Purpose Grade Belts and Fire Resistant Belts can also be supplied with a low rolling resistance compound for the back cover to optimize power consumption. 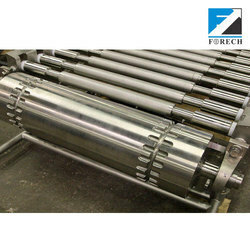 For detailed technical specifications please refer to Forech.